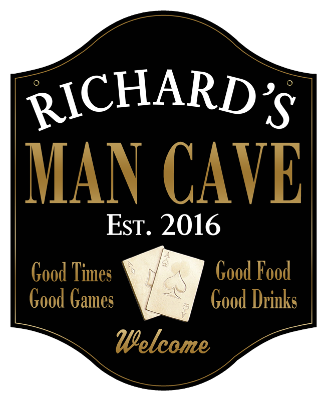 Whether you like poker, blackjack or other card game, this Personalized Man Cave Sign Poker 2 - Metal comes with your name and second line of text. Ideas for the second line of text could be the year you established your Man Cave, the city and state for your Man Cave, a favorite saying or even a declaration about hunting or being an outdoorsman (Eg. Est. 2016). Our Exclusive Design since 2010.